It’s always interesting when a single tweet like this attracts some attention or starts a bigger conversation. I’m noticing the word ‘customer’ sneaking back into digital government language. It (incorrectly) implies people have a choice when using services. I have a genuine concern about the use of the word ‘customer’ in the context of designing public services. I want to be clear, the point I was making isn’t about how people perceive the use of the word customer when used towards them. It’s about how our choice of language changes how we act when designing services. In my experience, the language we use can affect the empathy we bring to a situation. It’s why I worry when we talk about customers. It feels like we’re treating ourselves as one-step removed from the people we’re delivering services for. We’re all people. We all have an equal chance of needing the services we’re delivering. When designing public services we are not our users, but we are equal to them, or them to us. I don’t think I could honestly describe the relationship between customers and business in the same way. It’s admirable to want to deliver excellent service, or ‘customer service’. Much of the commercial business world is driven by this, but I think there’s a danger of using a generic term for different things. As Lily pointed out, by using the word customer, we encourage the wrong kind of service thinking – we imply the choice of engaging rather than necessity of people needing to use a service. There’s an implicit difference between whether we’re marketing or communicating. It’s sometimes a nuance, but I think it matters. Government services aren’t about marketing a message and therefore selling a product. Instead, they’re about communicating a message to support a series of activities or things people need to do out of necessity. Maybe it’s because of my background of work outside of the public sector, but my idea of ‘customer’ is defined from more commercial values. Customer focus means the creation of features, content, and the design itself exists to engage people, usually in order to sell something. In contrast, user focus in government means making it simpler, and faster to access a service. The value we create is often what happens as a result of the services we deliver, not the service itself. Our focus on people in government sometimes means doing less rather than more. To be clear, this is not customer focused (engaging to sell), it’s people focused (serving at the point of need). It’s important that we don’t confuse what we’re doing with the perception that we need to engage people. I think the language we use influences how we think about this. It’s not always a conscious set of choices when we create our service roadmaps, but it matters. Government is often guilty of doing too much, and we should ask if a perception of delivering ‘improved customer service’ might be partly responsible for services not working as well as they could do. If there has been a long standing focus on ‘customer service’ we have to ask what has gone wrong in the past when it comes to delivering services that simply work well for people? It was also good to get feedback from others about their perception of using the word ‘customer’. There are people I know who have seen ‘customer’ perceived as a positive term by end-users of services. Experienced user researchers who have seen a positive perception of the word in places like job centres. But like I said before, I don’t think this is about public perception. Foremost I think it’s more important to think about how the words we use make us act and shape what we do. Another counter argument is that ‘customer’ is a widely used and understood term in the Civil Service. I can see why this is important and why we want to build a shared understanding around a common language. I just think the word itself is unhelpful. There is definitely space for different words in different situations. For example, when dealing with health services I think it makes perfect sense to talk about ‘patients’, as some of our delivery teams at DWP Digital are finding. You can make the argument, like Shaun did, that a focus on customers might help drive higher quality services but, like I discussed before, I think we need we need to be very careful when we define good as the same thing for commercial business and public sector. The goal of ‘customer experience’ is simply not the same when thinking about engagement versus necessity. Some people pointed out that maybe there should be more choice when using government services. Some services already offer choice, such as identity providers and ways of making payments within GOV.UK services. I think that’s fair enough, but it doesn’t change the fact that people have a single point of access to register to vote, tax a vehicle, or apply for Carer’s Allowance. I’m not sure that more choice within services makes people ‘customers’, but as we create more choice and flexibility in the way people interact with government – for example, channels, access and links into the 3rd-sector – I think this will further shift the conversation. And finally, as Stefan points out, customer is probably the worst word – except possibly for all the others . I’m not sure I completely agree with this. The real issue for me is still the context that requires the use of the word. 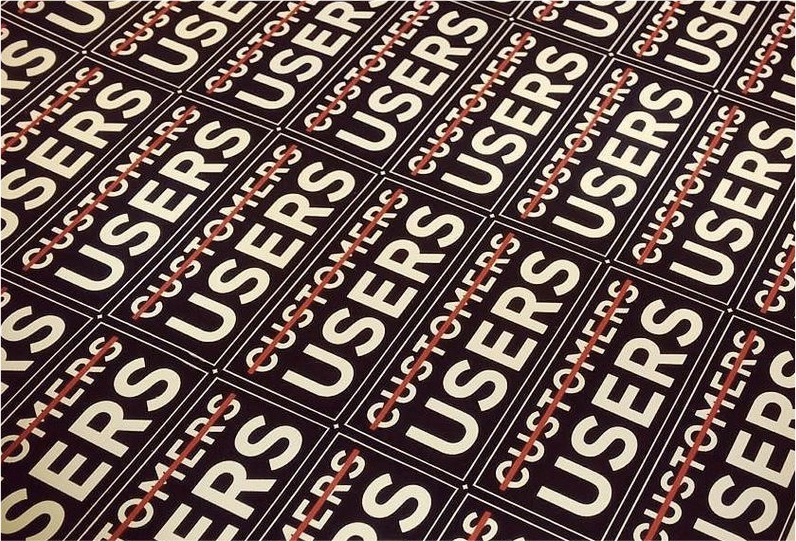 If we talk more broadly about ‘people’ and what they need from government I don’t think we need to worry as much about terms like ‘user’. It’s true that none of these words are perfect, but we still need a greater focus on making things work for people because we understand the use-case. This means being deliberate in how we continue to talk about user needs. The goal should be to remove anything, including language, that creates a sense of ‘us and them’ when working on a public service. In government, the reason we make user research a team sport, is to break down these barriers, to build empathy. As an insight, I’ve seen the language teams use about the people using their services change as they see people using services first hand. In the public sector, we’re not selling something or looking for an audience. Designing something for everyone is a much greater challenge than designing for a ‘customer’. We need to find a language that helps us make things work better. In summary, this language has to be deliberate and intentional. It’s easy to drift into words that disconnect us from the very people we’re designing for. I raised the point because it felt like we had stopped talking about it. Some people will argue it doesn’t matter, but I believe that it’s the type of detail that does if you really want to transform how institutions like government function. It’s certainly not any sort of scientific study but I’ve generally found that the people more comfortable with the term ‘customer’ in government have been working in the public sector for longer. Many others, like myself, new to the Civil Service are more uncomfortable with this thinking. Even though we might disagree, as I said on Twitter: I’m glad we’re having the conversation.